This is a stunning large size floral full crown. Sparkling clear genuine Austrian rhinestones are set in a beautiful silver-plated setting. All rhinestones sparkle a lot and are prong set by hands! This crown is full of sparkle! 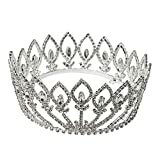 It is perfect for pageant, prom or any special occasions. Material: copper with rhinestone, cup chain, silver-plated. Size: front center is approx. 3-3/8 inches in Height, base of crown is 5-1/8 inches in diameter.